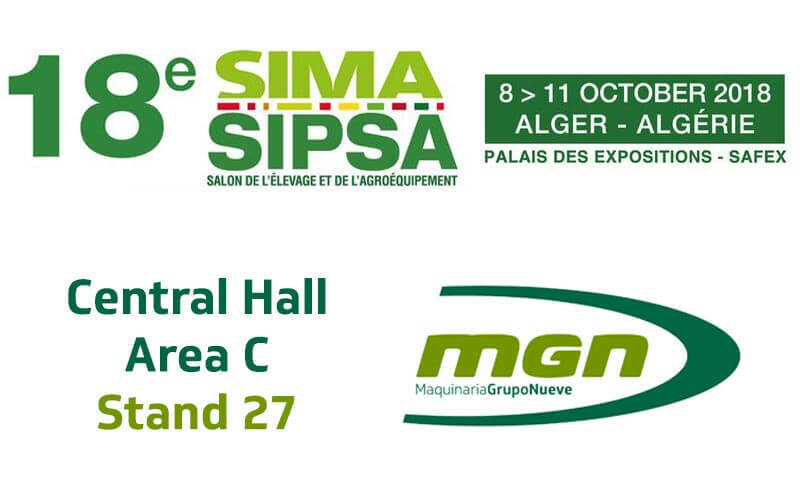 Maquinaria Grupo Nueve will be exhibiting its feed mills at SIMA-SIPSA, Algeria, from 8 to 11 October. The seventeen years of experience of SIPSA in livestock and the 77 years of expertise of SIMA in the agri-food business have combined in Algeria to form the largest trade show in Africa dedicated to livestock and agro-business. This year it is expected to attract more than 20,000 trade visitors and 600 exhibitors from 30 countries. The SIPSA-SIMA partnership which is emerging at the gateway to Africa offers an extensive and high-quality range of products, equipment and services and will provide an exclusive opportunity to supply solutions which are tailored and designed specifically for the development of farming resources in the North African and African regions, thereby substantially improving their farming productivity. MGN’s team will be exhibiting their machinery and solutions for all types of projects, from small installations to complete “turn-key” feed mills. We will be exhibiting atCentral Hall, Area C, booth 27. Visit us!